The San Diego quilt block had me thinking of sand and surf, hence, my colour choices for this block. This eight patch block is a sort of two-parter, as the centre of the block is made with a small Sawtooth Star, and then completed with a variety of patches to stretch your learning experience with regard to the construction of this star block. 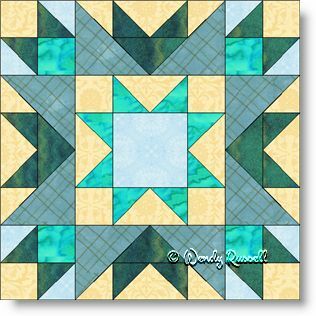 Sewing this quilt block in "chunks" makes it easier to construct and this pattern is designed to sew it as an uneven nine patch. The two sample quilts illustrated are both made with blocks set on point, but as you can see, simple change-ups of the fabrics in the blank blocks give a totally different look to each of the quilts.